Get First Transpennine Express train times, routes and cheap train ticket online here. You will be able to book your ticket to any of the top destinations listed and more, including trips to Manchester, Leeds, Scarborough, Glasgow. And more. The beauty of buying train tickets directly from the Transpennine Express website is that you will not be charged a credit card processing or booking fees and you can get your tickets up to 50 cheaper than buying from the train station on the day of travel. 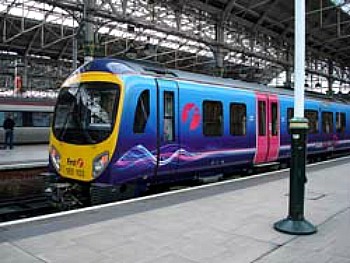 First Transpennine Express trains provide services across some of the most popular destinations within the UK. Covering many cities in the Midlands, North of England up to Scotland, this first class train company run by First Group is arguably one of the most important UK railway networks. If you are travelling from Manchester to Leeds, or Liverpool to Edinburgh, you will most like find yourself travelling on one of the carriages of the Pennine Express. A recent survey by the UK Tourism Board showed that six out of the ten top UK holiday destinations are covered by the Transpennine Express rail network. If you are planning to go on a holiday within the UK that will not cost the earth in terms of transportation, then consider grabbing a cheap train ticket on the Trans Pennine Express trains in advance and save up to 50% with no booking fee to pay or credit card fee. First Transpennine Express Train Routes & Tickets. You probably would want to look up and plan your journey ahead of getting your tickets on the Pennine Express train service, if you are new on this route. This train operator primarily runs inter-city services along three main routes connecting Middle and Northern England with parts of Scotland. Whether you are a student or a big footsie fan, you will be spoil for choice on how far you can go on the Trans Pennine train routes. You can get tickets to Manchester or back to University in Leeds, or to see one of the twenty top Premiership, Championship and Division One football team all within the Pennine network. The Transpennine express routes include Newcastle, Middlesbrough, York, Scarborough, Leeds, Cleethorpes, Sheffield, Edinburgh, Glasgow, Carlisle, Barrow in Furness, Blackpool, Lancaster, Preston, Manchester, Manchester Airport, Warrington, Windermere and Liverpool. Buy you First Transpennine Express train ticket directly from the Transpennine website here and checkout the latest deal on offer. See Pennine train times, scheduled changes to train services as well as get live updates on the First TransPennine Express rail network here. You can also get train tickets on any other UK railways network from Transpennine Express.